The newly revised proposed Produce Rule is drastically different than the original provisional rule. 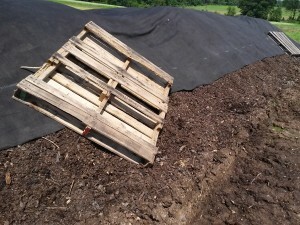 Growers are encouraged to comment on the changes, and respond to several questions that the FDA has about animal based compost requirements. Please consider commenting – comments are due by December 15, 2014. In the previously published FSMA proposed Produce Rule, regulations for animal based composts required a wait period of nine months for raw manure applications (not composted or composted in a non-approved manner). The revised rule recognizes the need for additional research and risk assessments, and has withdrawn the 9-month interval between the application of raw manure and crop harvest. This rule will be amended once sufficient research has been conducted and evaluated. The FDA has stated that “At this time, the FDA does not intend to take exception to farmers complying with the USDA’s National Organic Program standards, which call for a 120-day interval between the application of raw manure for crops in contact with the soil and 90 days for crops not in contact with the soil.” The 45-day interval between application of compost and crop harvest, specific to previously specified composting methods, has also been withdrawn. The FDA is seeking comments on requiring the adherence to the NOP 120-day interval standards, the prevalence of animal based manures in composts, and information on barriers that will be faced for farms transitioning from raw animal manure use to only composted animal manures.